When in Bali last year we stumbled upon this super hippy dippy vegan cafe just 10 minutes from our villa. During our stay we ordered delivery many times and even went in for breakfast one morning, primarily to gawk at all of their organic baked goods. One item I knew I had to try the moment I saw it was their vegan mud pie. Not all mud pies are made equal – this I now know. For dinner one night I ordered a salad and one behemoth slice of their famed mud pie. Two bites in? Eh, kind of disappointed. 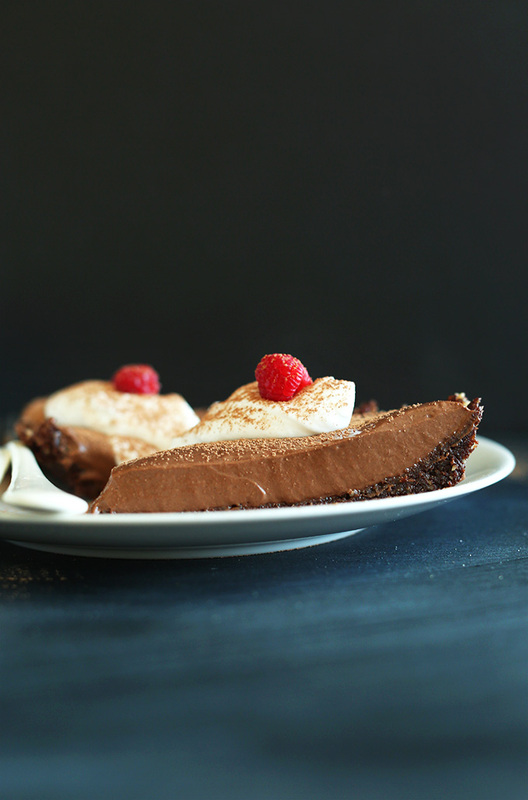 How can a mud pie disappoint, you ask? I don’t know! But something was amiss. This had to be fixed (clearly). 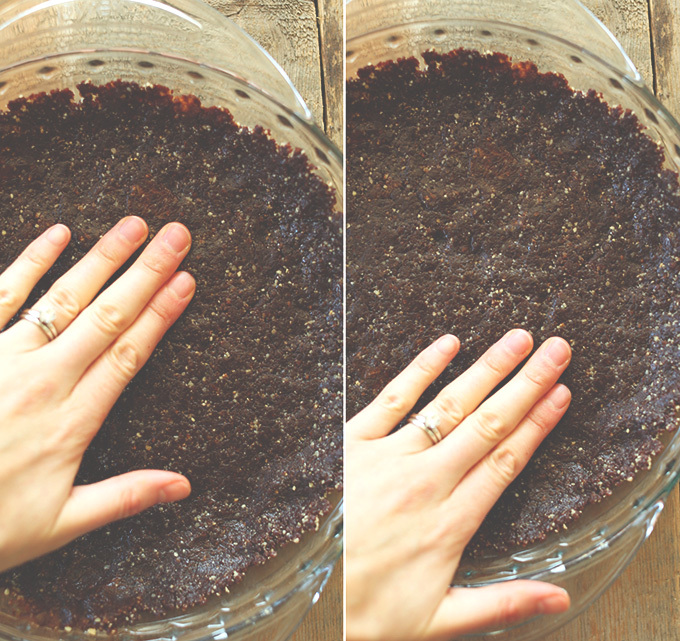 This pie begins with a simple, 3-ingredient crust that’s essentially a raw brownie. Raw walnuts, dates, and cocoa powder (or cacao powder for a true raw brownie experience). Pressed into the bottom of a pie pan it makes the perfect crust for your 3-ingredient, fudgy chocolate filling. This filling is so easy and so undetectably dairy-free it’s ridiculous. Silken tofu is the magic here. Before you get all, “Tofu is gross, what is it anyway, isn’t it bad for you?” hear me out, Rhonda. I too was once skeptical of tofu, but since learning about the health benefits of soy from some reputable health sources (namely Dr. Andrew Weil), I know organic, non-GMO tofu can be extremely healthy for your diet. It’s high in protein, low in fat and has even been found to lower cholesterol by up to 40 percent. I’m not a health expert nor am I recommending you start eating tofu hand over fist (it’s not for everyone). I’m just saying, it’s nothing to be afraid of! 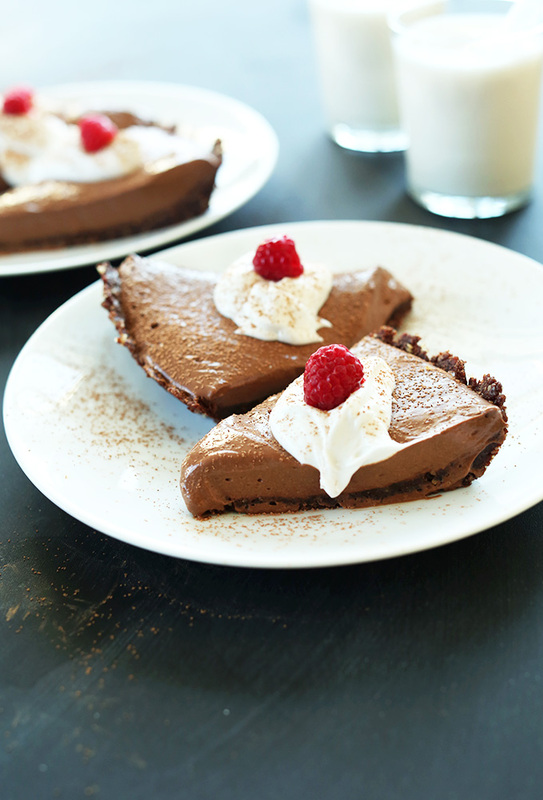 Especially when added to silky, chocolatey pies such as this. The texture of this pie is absolutely sensational. Creamy, rich, mega chocolate-y. I had one small slice and was done for! Usually I eat large servings of dessert and hardly feel satisfied. But with this, a little goes a long way. You can serve it two ways: Chilled or frozen. I tried both and preferred mine frozen because it’s much easier to serve as it’s firmer in texture. But chilled is good too, just know it takes a little finagling to get those first couple pieces out of the pan. You can also freeze it to set, slice and then let it set out for 10-15 minutes so it’s more like pudding. Plus, it has a brownie crust! What’s not to love? Make this pie! And if you do, take a picture and tag it #minimalistbaker on Instagram! I’d love to see. Cheers! 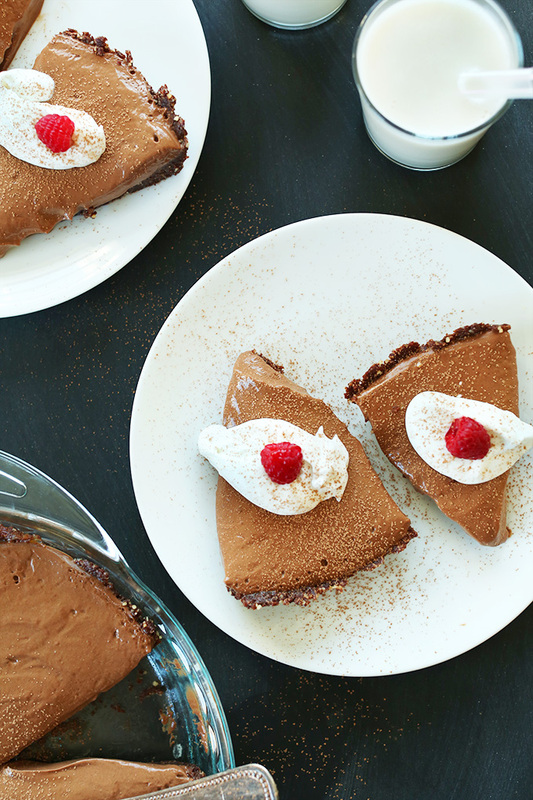 Creamy, 6-ingredient vegan chocolate pie so satisfying you'd never guess it was dairy-free! Silken tofu pulls a sheet over eyes with its super silky texture and neutral flavor. Chocolaty, rich, fudgy - what's not to love? 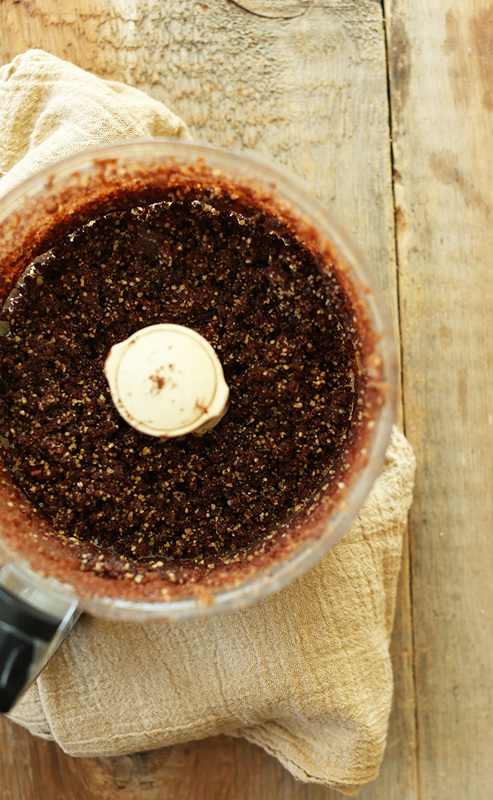 Prepare the crust by pulsing walnuts and cocoa powder in a food processor until it reaches a fine meal. Remove and set aside. Place soaked dates in the food processor and process until small bits remain and it’s sticky. Add back in the walnut-cocoa meal and process until well combined. Transfer to a glass pie pan lightly oiled with coconut oil. Alternatively, place parchment in the bottom for easy removal. Place a piece of plastic wrap over the crumbs and press with your hands to form a uniform crust that goes up the sides (see photo). Pop in the freezer to set. 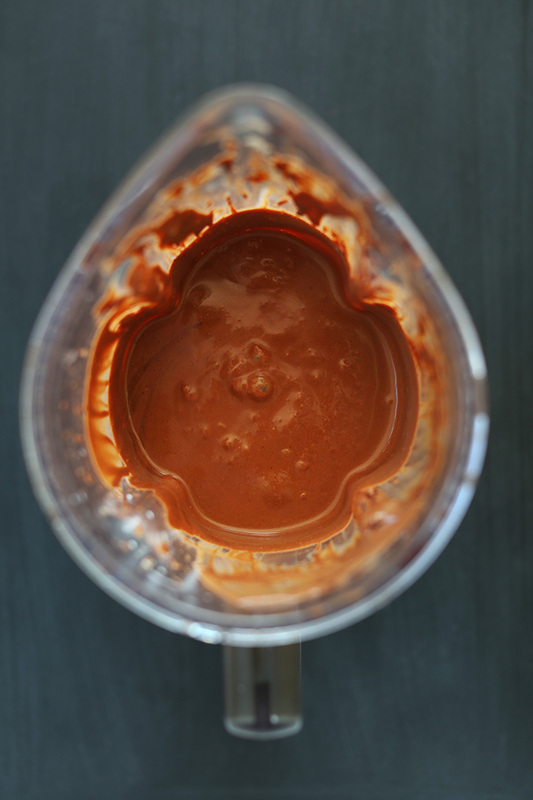 Melt the chocolate chips over a double boiler or in the microwave in 30 second increments. Once melted, work quickly to add to a blender along with the tofu and coconut (or other dairy free) milk. Blend until smooth, about 1 minute, scraping down the sides as needed. Pour over crust and smooth. Cover and freeze until set. Alternatively, refrigerate for at least 2 hours or until pretty firm. For easiest serving and longer storage, freeze. Serve and top with coconut whipped cream. Will keep in the fridge for several days, though best when fresh. Freeze for up to a few weeks, covered well. I love this recipe but really struggled with the dates. They just wouldn’t break up. I soaked them in hot water too for a long time. Any suggestions? Did you use medjool dates? Do you have a powerful food processor? Those would be our best suggestions! Hope that helps! I made this the other day and used the coconut cream instead of the coconut milk. It came out very hard. Will there be a softer, smoother difference if I use the coconut milk? Thank you. If you are looking for a softer texture, using coconut milk would be a good choice! Hope that helps! I made this 2x now and it’s amaZing and such a big hit! The second time, I added peanut butter to the filling. Yummmm!!! Question: do you think I could use the filling as a stand alone pudding? So glad you enjoyed it, Suzanne! We think the filling would make an awesome pudding! Great idea! Hi! Do you think this would be good with peanut butter added to the filling? I made this over the weekend and what a huge hit! I used can coconut milk and scooped out as much of the hard stuff on the top as I could, so I’m thinking that helped cause its pretty firm when just sitting in the fridge! Tried to freeze it and broke the tip of a knife, LOL! My pre-schoolers LOVE it so huge mommy win for me!! :) Thank you I absolutely love this blog and every one of the recipes I’ve tried so far! This is my favorite pie! I have made it a few times but this year I made it for Christmas. My mom who hates tofu, enjoyed it very much! Thanks for posting this recipe. I tried it and loved it. It’s even better after un few days. I used 75% chocolate bars. As a variation, I use raw organic peanuts instead of walnuts and added some coconut flakes and it’s great as well. Smart! Thanks for sharing, Geraldine! Great recipe! Even people whole aren’t vegetarian/vegan love to eat this!! Also, I didn’t have any coconut milk so I used blended cashew cream instead and it tastes really good. It ends up being more a olidified too if that’s what you like. Hi Michka! We cover ours with plastic wrap to set! So, what type of silken tofu is used? There’s different firmness, i.e., soft, firm, etc. Silken is just the silkiness, not the firmness. Hi Rayca! Other readers have had success with firm silken tofu! Hmm we haven’t tried and really can’t say for sure. Let us know if you experiment with it! Absolute perfection. Not too sweet, and so simple! This will become a regular make for us. I made cupcakes out of these, and they were absolutely lovely. Whoop! Glad to hear it, Cynthia! I made this fabulous dessert tonight. My husband and I thought it was absolutely delicious! Because I had 16 ounces of silken tofu, I increase the amount of chocolate chips to 2 cups but used only half a cup of light coconut milk. I also lightly sprayed the glass pie pan with canola oil . The pie easily came out of the dish and the consistency was perfect. Thank you, Dana.! I have enjoyed every one of the your recipes that I have made! I so appreciate you and your willingness to share your culinary creations! Thank you for sharing your recipe changes, Liz! We are so glad you enjoyed it! Do you think I could substitute pumpkin seeds for the nuts due to nut allergies? Or other suggestion? Hi Lisa! We haven’t tried using pumpkin seeds and can’t say for sure. If you give it a try though, report back! You may be interested in using this crust instead? I’m a learner in the kitchen (and live your recipes) . I don’t even have a pie dish- would anyone recommend size dish for this recipe please. I just want to thank you for all of your amazing recipes! I love your blog and your work never fails to impress. I have made this pie countless times, and sometimes just make the filling, and serve it as mousse. This is one of my allltime favourite recipes – it’s so quick, easy, and delicious! Thank you again for all your work. This blog has helped made my veganism so, so enjoyable! Amazing recipe!!! My omni family couldn’t believe this was made from tofu. I did an Oreo crust instead (because I am nothing if not a FAT vegan haha) and it was delicious. Added a little coconut oil (2 tsp I think) to help it solidify. Made this for my husband who is lactose intolerant and he loved it – said it was nice to have such a rich creamy dessert without feeling sick later. Will definitely make this again. I made this and it was delicious. A keeper for sure! Due to ingredients I had on hand, I made the following tweaks and it worked very well! 300g Choc (same as recipe called for) but I mixed 74% dark choc and another lower quality dark cooking Choc. 50g/250g split. Also I substituted walnuts for a mix of cashews and hazelnuts in the base. Put it in freezer for approx 3 hrs before serving and it was perfectly set and silky and smooth. Pieces held together well but wasn’t too hard. This was a dream! I spent quite a bit of time (and towels) drawing out the liquid from the tofu and I believe it contributed to the extra firm and silky quality. I followed the recipe and even my extremely picky eater (10 year old) absolutely loved it. So thankful for this winner of a recipe -excellent job and thank you! I can’t wait to try a white chocolate version with some lemon zest! I made two for thanksgiving and my in laws (who are VERY against vegan food in general) LOVED them! It was such a hit that I had to make two more pies because they were gone so quickly. I will definitely be making these again and again. Hi Denise! Either cashews or almonds would work! What was there not to love about this recipe?! I followed the recipe exactly as written. I expected the pie filling to be soft given the comments, but after taking it from the freezer and letting it sit out a bit, it held up perfectly, smooth and creamy. The amount of crust and filling fit PERFECTLY in my 9 1/2″ x 1″ round tart pan giving the presentation more pizzazz. Finally, it’s a no bake recipe which makes it less time consuming and does not involve heating up the oven on a hot summer day. This recipe is a keeper. Thanks, Dana. I’m gathering pie recipes for my Dad’s 85th birthday party (two weeks from today!). He hates cake, loves pie, so guess what I’m doing for the next two weeks solid? I’m a lone plant based doctor (one of Dr. Weil’s fellows, actually) in a sea of carnivores amongst my family and their friends, so “sneaking” tofu to them in a seemingly decadent pie seems like a good plan. I’m making mini-pies to save the mess of the giant pies, so thanks for the tip up above in reviews. My question is : has anyone tried freezing this (or any other tofu pie), and was it successful? Yes, you can freeze it! This is my new favorite dessert. I make it just like the recipe. My daughter has Celiac’s disease and is Lactose Intolerant and is vegetarian. I’m trying to do the Forks over Knives lifestyle change. I have been vegetarian all of my adult life and I’m Lactose Intolerant. 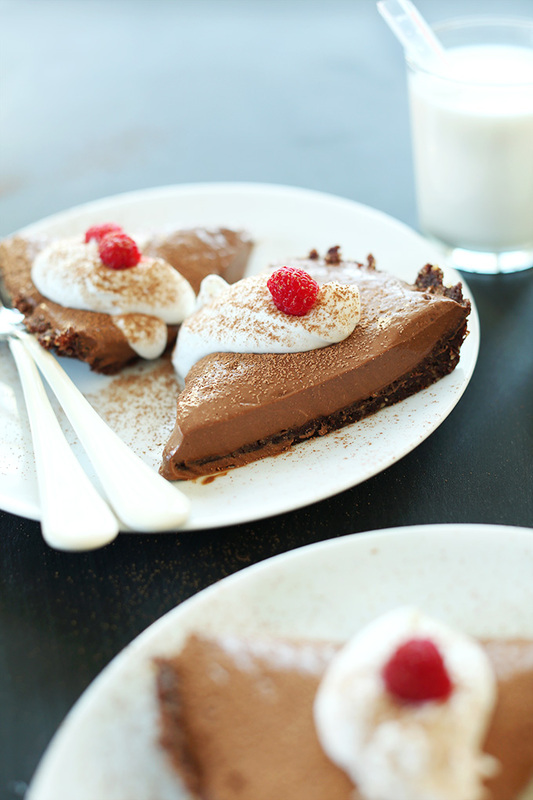 This pie takes care of my sweet tooth and is healthy, too. Love this recipe just the way it is. I make it for special occasions. It works for my vegan friends and for my daughter who is vegetarian and gluten and dairy free. It is a hit at pot lucks. I made this using cocoa powder and sugar instead of chocolate chips and it was well received. Thinking about trying this as a coconut cream or banana cream pie by tweaking the tofu mixture a bit. Where do you get coconut whipped cream in California? Does it have a bunch of junk in it ? Also can you use coconut cream instead of dairyfree milk in this recipe? Great recipe! I used firm tofu as another commenter suggested, and I used a store bought Graham cracker crust since I already had it handy. Delicious! I made this yesterday for my birthday. 100% delicious and such a crowd pleaser!!! Can’t wait to make for future events and wow people that it’s vegan! This is very good and company agreed. Made it in small, individual tart pans. (Makes 4) The crust really compliments the pie and I thought topping with strawberries made it even better. Used coconut cream and had zero issue with it keeping firm. Used Nasoya organic silken tofu and had no “tofu” taste. And Trader Joe’s “accidentally” vegan chocolate chips. If you like chocolate this won’t disappoint. Thank you for a great recipe- it’s a keeper. I’m in heaven!! I was craving something sweet, and since I had a package of silk tofu in a fridge, I started searching for recipes, and came across this page. So easy, quick and dreamy! Since I’m not a walnuts fan, I substituted them with almonds. Also I used carob powder instead of cacao because I just ran out of it, and it worked just fine. So happy that I found this recipe, it’s really delicious! I used cacao nibs instead of actual chocolate chips. It is very rich and chocolatey – so much so that it prevents me from overeating but I still get my dessert/chocolate/sweet craving satisfied. All in all, I think I would gladly make this to take to a party with coconut whipped cream as a topping. I would cut very thin slices to serve it because of its richness. Hello! this looks so yummmmmmy! Soy gives me hives, so that’s a no-go, but I saw coconut cream mentioned above… Would that substitute for the silken tofu? Would I use 12 oz? Any other tips? Any suggestions on how I could sub mostly cacao powder instead of the chocolate chips with maybe a little honey as a sweetener? Really try to cut out he extra sugars as much as I can! Thanks-love the site! I made this for Christmas and LOVED it. Made ahead and froze it, then took it frozen to our family potluck so it was perfectly thawed by the time we served. 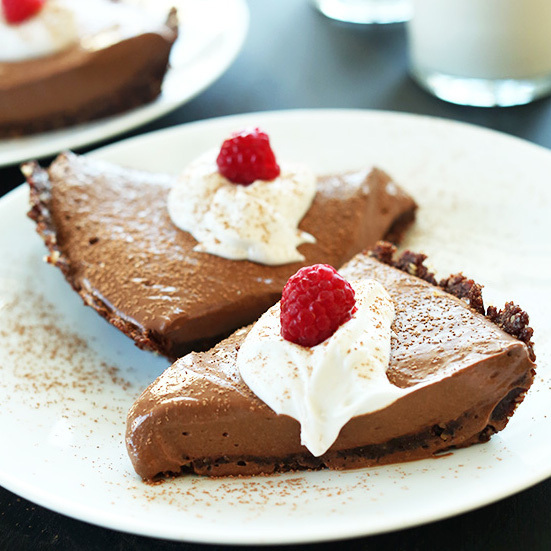 The filling is thick and rich and the chocolate in the crust is a brilliant touch. I made this it was amazing! Just made this and find it to be just ok. I used Enjoy Life semi-sweet chocolate chips (which I’ve use for other recipes and like them), Sprouts store brand organic canned full fat coconut milk, firm silken tofu, and a store bought frozen pie shell I had left over. So this is a review on just the filling. I stuck the pie in the freezer for an hour, checked it was nice a cold, and cut a slice to taste. I use vegan recipes often since I can’t have dairy, but next I’m going to try a classic french silk pie, eggs and all, with vegan butter. Do you have a nut free pie crust that would work well with this filling? I’m going to make these for a pie day at school but nuts are a no no. This pie is very tasty, and easy to make. I used a graham cracker crust and added a teaspoon of arrowroot powder to stiffen the filling a bit. Calling for 12 ounces of tofu silken tofu instead of scaling the recipe up to use 16 ounces (the typical package of tofu) is ust not an economical use of ingredients, Twelve ounces makes it tough to double the recipe as well. Something to consider in the future. Just made this and it was totally delicious – Because I didn’t have any dates I swapped the base for your almond/oat/oil baked base which was a great combination and added some salty crunch to the overall experience. (In a further change due to another missing ingredient, I swapped the coconut oil for cold-pressed sunflower oil – also delicious). Congratulations on your efforts and thanks! That should be 5 stars, but it wouldn’t let me choose the 5th! I don’t normally comment on recipes nor have had success in the past with vegan deserts, but this was just sensational! thank you kindly for sharing a wonderful recipe. I made it tonight and turned out perfect! Dana, you are a star! Wish i read the comments before making this but thats okay as i will make this again and again, will try cup cake size next time. I did find it a little too sweet and will try substituting it with less maple syrup, then again its probably fine for others as i am quitting sugar slowly. I used dark chocolate which worked nicely (made it rich and stopped me from devouring the entire thing!). Cannot wait to share this with friends, make it for Christmas and surprise people its a vegan recipe. What i love the most about this is that it is pretty much tastes the same as a standard chocolate mousse!! LOVE this recipe! I added a dash of cinnamon and about 2 tsps of instant coffee to the chocolate to hide the tofu taste a little – I was so nervous for my anti-tofu family to be able to tell! The pie was a TOTAL hit and I waited until they all had at least a few bites before I broke the news that all loved this vegan pie that is made with tofu! Thank you for yet another amazing recipe! I’ve never used tofu before, so I’m trying to figure out if I should use soft, firm or extra firm? Hi Ivana, check out other comments for more information about this but I’d suggest extra firm! I tried making the pie yesterday – it was fabulous! Thanks for the recipe. This was so delicious! The one thing I would suggest is making individual servings in ramekins because serving slices of it was a challenge. It didn’t look as good as it tastes by the time I was done trying to plate it! Maybe I did something wrong but next time I’m doing ramekins! I also added a fresh raspberry sauce. A little fruit sent it over the top! What’s the size of the pan? a standard pie pan! I believe 9 inches? I made this for friends and we all agreed it was incredibly sweet; cut the use of chocolate chips to just 1-cup and it was much better. No one was able to guess that I had used tofu in the ‘cream’ part of the pie; awesome vegan dessert! Just made this. So easy and delicious!! I cheated and used a pre made crust this time. Thanks for sharing! Does the walnuts have to be raw? Incredible. Non-vegans went crazy for it here. My changes: Mori-Nu Silken Extra Firm tofu, with slightly less than 1/4 coconut oil added. I wanted a firm pie. It was perfect. Frozen for an hour before serving. Thanks so much minimilistbaker! This is delicious!! I love it and it was so easy to make. Thanks! I just made it today for the first time, and it was amazing to try something so simple and speedy. I’m used to spending hours working on things (and cleaning up after them) and this was so painless. Amazing! I got to thinking “I wonder if there are any healthy pie recipes out there”. A short Googling later turned up this recipe. I brought it in to the coworkers for evaluation as my tastes are a bit eccentric and it was unanimously decided that it was easily one of the best desserts they’d ever tasted. Then I told them that it was dairy-free and packed in some pretty awesome raw ingredients and they have all since DEMANDED the recipe. Thanks for sharing this with us, Dana. A true masterpiece. one of the best vegan/gluten free desserts I have ever made! It was a huge hit with non vegans alike. They couldn’t believe it had tofu in it :) served it with coconut whipped cream OMG. think I might go make another one right now, my mouth is starting to water. thanks so much for the amazing recipe!! My son’s girlfriend brought this to Christmas dinner knowing that I can’t eat most desserts. I was so blessed and it was fabulous. She went out of town to Mexico but upon her return emailed me the link to this luscious pie – I’m so excited, makin your pie tonight – yeah, I get dessert! Last nights dessert was prunes and almonds – meh! Can’t wait and so glad to be introduced to the minimalist baker! OMG! This is super easy to make and amazing. Even the non-vegan family loved it :) I added cacao nibs and black chia seeds to the crust…delicious! Thank you so much for posting this. to be GF.Thank-You so much. I made this recipe and was a real success! yay! Thanks for sharing, Carolina! This is soooo delicious!! so moorish, so creamy and tasty. Super easy as well. Thank you so much for the recipe I am obsessed with it! Kind of a dumb question, but does the coconut milk give the pie a strong coconut flavor? Would it hold up just as well using almond milk? Amazing! Probably the best cake I’ve ever made. I used silken tofu, and consistency was great. Somebody mentioned coconut oil, but it worked well without it. The firmest raw vegan cake I ever had! 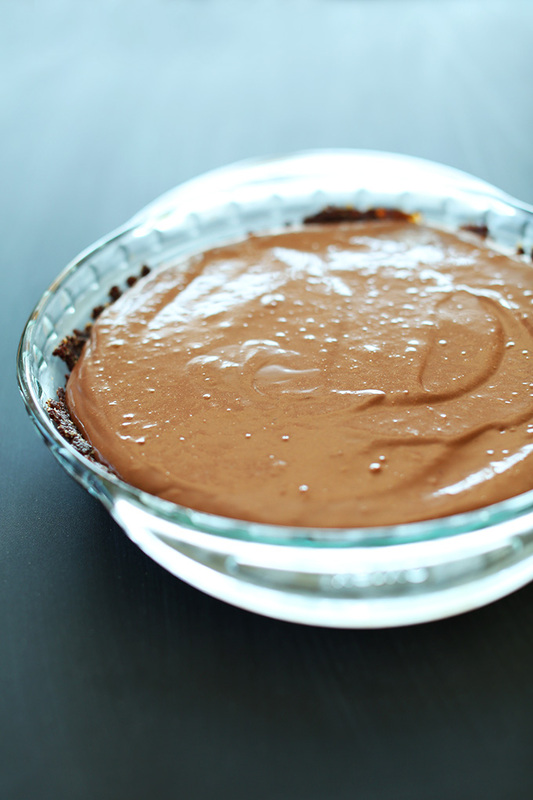 I used special dark unsweetened cacao powder and the result is unbeatable. Definitely making it for my birthday. This is a great recipe. I have made it twice and both times it went over big time. Both times, however, I found that the pie was too hard coming out of the freezer, even after sitting out for 20 minutes or so. In fact even after it was cut and sat out for an hour or more on a July evening the pie held its shape much more so that the one shown in the photos that accompany the recipe. Perhaps this is because I used Firm Silken tofu. (It is also available in Soft and Extra Firm.) I also used low-fat coconut milk in the filling. I think if I made it again (and I likely will) I will simply refrigerate it. I used your crust and a similar filling. My filling was a little firmer and no need to freeze. My ingredients for the filling are: 1 package silken firm tofu (did not pat dry and barely drained), 1/3 cup maple syrup, 1 cup Enjoy Life dark morsels, & 2 t. of maple syrup (same prep). It’s superb, but I cannot remember where I got the recipe. The crust for us was a bit too sticky/wet/oily. 3 of us felt it would be better if had more of a baked texture. It just didn’t go well with the filling. It was almost like having the filling on a raw brownie, each of which are great on their own, but for us it didn’t work. Would love to figure out a way to make it work (needs to be gluten-free & vegan)! Any suggestions? Thx! I added raw cashews to almond milk and blended till smooth in a vitamix and then added 2 tablespoonfuls of cocoa and 2 teaspoonfuls of vanilla . I also increased chocolate chips to 2 cups of 60% cocoa type, blended all together and poured in a chocolate graham crust. Froze it and ate for pie day, it was so simple to make and super rich and tasty. Any chance you could convert the cups and ounces to grams for me?? Or maybe direct me to a link that you use for both? I’d really appreciate it, thanks! Today was my mothers birthday and she requested French Silk Pie, along with a vegan version for my sister. The recipe I used for the non-vegan pie is one that has been in my family for 4 generations… for a standard sized pie shell (or in my case, 12 mini graham cracker pie shells), the recipe calls for 1 stick of butter, 3/4 cup of sugar, 2 eggs, and ONE ounce of chocolate (melted, unsweetened), all creamed together. And it comes out tasty every time. Since I trust your site, I just accepted it and bought the ingredients. Since I was only making 6 mini pies instead of 12, I halved the recipe. That’s 5.25 oz. And since it still seemed like so much to me, I only put in 4.5 oz of chocolate, and I added 1/3 cup instead of 1/4 cup of the coconut milk (halved recipe, remember)… and 6 oz of tofu. When all was said and done, the pie filling was wayyyyyyy too strong. Firstly it wasn’t sweet enough at all so I put a bunch of sugar and it still wasn’t sweet enough. And it was way too chocolaty. It was a couple shades darker brown then yours here. I added another generous 1/3 cup of the coconut milk and some more sugar, and even then it was still really strong. It almost tasted like a really thick triple chocolate brownie batter. I had to fudge with it a little more before it was okay (and I somehow ended up with over double the amount needed to fill all the mini pie shells!! ), but it still wasn’t /that/ good to me. I don’t think it was your recipe, since everyone else loves it! And it isn’t my calculations (halving the recipe and using ounces instead of cups for the chocolate), because I quadruple-checked my math. And I didn’t forget to put anything in, and I measured correctly… so what could it possibly be??! Any ideas? Just wanted to let you know – I’ve made this recipe three times in the last couple months. Thanksgiving and Christmas included. It’s been a hit every time! Thank you for this amazing recipe! I made this pie along with some other dishes fro the holiday meal suggestions. It was a hit! I froze it and then put it in th fridge a couple of hours before serving…The consistency was sort of like melty ice cream…perfect. The crust did crumble a bit and the next day it wasn’t holding it’s shape quite as well, but I adored the crust. This was a perfect dessert for my 6 year old who can’t have wheat or dairy, and misses both. Great recipes, thanks for sharing. I’m a tad baffled by a couple things tho. First, the “crust” – the recipe made a LOT of the mixture! I have a feeling mine came out too thick (not that anyone is complaining, it just seemed like a lot). The problematic bit was how super sticky it is! I didnt have coconut oil on hand, and the vegan aspect of the recipe was not important to me, so I substituted butter for greasing the pan. Froze the pie and found it impossible to serve without utter destruction! Laughed and called it “delicious chocolate slop” but would like to fix this for next time. Am I the only tester to have this problem? Second was the direction for serving. As mentioned, I froze the pie out of concern it would be too messy to serve simply chilled (irony noted)… But even after the suggested 15 minutes to thaw, that thing was rock solid. It was actually still pretty frozen after an hour, so I finally just served it as is, instead of how I’d intended – as a silky creamy pie. The combined snafus were a bummer but the flavor is incredible – when I tasted the filling I was surprised and wary of the fairly obvious and distinct tofu-flavor that came thru…but after chilling that flavor disappeared entirely and left behind only the promised “mega chocolate-y-ness”. Because it was so, do tasty I plan to try again, but would love to fix whatever I did wrong to make serving all but impossible. My boyfriend made this for me as a surprise treat and omg it was amazing!! The filling alone could be eaten with a spoon. I also am addicted to larabars and I love that the crust was one giant larabar. This is a stunner!! I made this tonight to take to a BBQ. No one even had a clue it was even Vegan, let alone that it had tofu in it. It was a hit with the carnivores and veg-lovers alike. We will definitely be repeating it. Thanks!!! Hi, this looks wonderful! I was wondering if there was a specific brand of tofu that you used for this. I’ve used mori-nu for a similar recipe (based on a recommendation) and loved it, but the grocery stores near my no longer carry it. I am hesitant to try another brand because I’ve heard some can be very tofu-y in flavor, so I was wondering which brand you use. Unfortunately, that’s the brand I love, too! Otherwise, I buy from Trader’s, but they don’t carry silken. Sorry I couldn’t be of more help! Oh. My. Gosh! I made this tonight and . . . whoa! Let’s just say that I have to wake up early to squeeze in a jog after the damage this pie did from me over-eating it! :) Thanks for the recipe–yummy! just made this recipe, it is sooo good! my boyfriend and I are quite impressed! Hi, can I use a regular tofu or does it has to be a silken tofu? regular tofu will not work here – it’s too thick and has a stronger flavor. My daughter asked me to make this. I was skeptical so I only made the filling, to be eaten like a pudding. OMG after chilling in freezer for an hour it’s indescribably yummy. The texture and the flavor!!!! Whole pie next time for sure. Thank you so much for coming up with these incredible recipes. We made your black beans brownies and the pb swirl brownies all the time. You’re a genius. This more than satisfied my chocolate craving tonight. My husband and I make our own tofu so I used that and I thought it was great..and fast! thanks for the great site! Yay! Glad you liked it! Thanks for sharing, Beth! Love the recipe. Only one problem. I thought I’d be clever by making them mini in a cupcake tin… I didn’t get a single one out whole. Any tips for that? I even used a brief hot water soak to loosen things up. Use parchment liners next time!, Or freeze them and use my tab method found here. This came out amazing! I subbed pecans for the walnuts. We we’re divided on the chill factor! My kids liked it frozen. I loved it with softer silky texture! I will make my crust a little thinner next time, which is today because I am making it for a Mothers Day Brunch! Nice! So glad you all enjoyed it. Thanks for sharing, Claudine! Happy Mother’s Day! I don’t usually comment on websites — but I have to let you both know that I just found your website and I LOVE it! I cannot stop checking out each recipe, pinning them, and making a grocery list! Thank you Nancy! You made my day! Just made it and was amazed from the result. Super creamy and yummy. Had this silken tofu in my fridge and didn’t know what to do with it..where to put it. Found your inspiration just in time. Can you use any type of nuts? I have lots of cashews, some almonds, a handful of other nuts and a few sunflowers kernals. I was thinking of mixing them together. Can you use cacao for the chocolate instead of the chocolate chips? It’s worth a shot! It will affect the flavor, but you shouldn’t have to freeze it to set up since avocados are so thick. Hope that helps! Oh my gosh, that sounds heavenly! That texture looks incredible! Tofu’s awesome in desserts and is so underrated. I’ve used it in cheesecake and mousse but this pie is far superior! I’ve made raw brownies before and am slightly obsessed. I’ve recently had to cut dairy out of my diet and have started following vegan recipes because they are a guarantee dairy-free. I was thinking of making mini mud pies with this recipe for a party, do you have any suggestions on how to form them? I have mini cupcake moulds but am worried they might loose their form in them. Any insight is helpful! ps — can’t wait to make this regardless! looks amazing! Hmm, I’d say use little shot glasses, small ramekins or small tart pans. Then serve them individually right out of the mold! WOW. Awesome. I want this right now!! Tofu is awesome for firming up dairy-free desserts, I’m not afraid!! Oh! 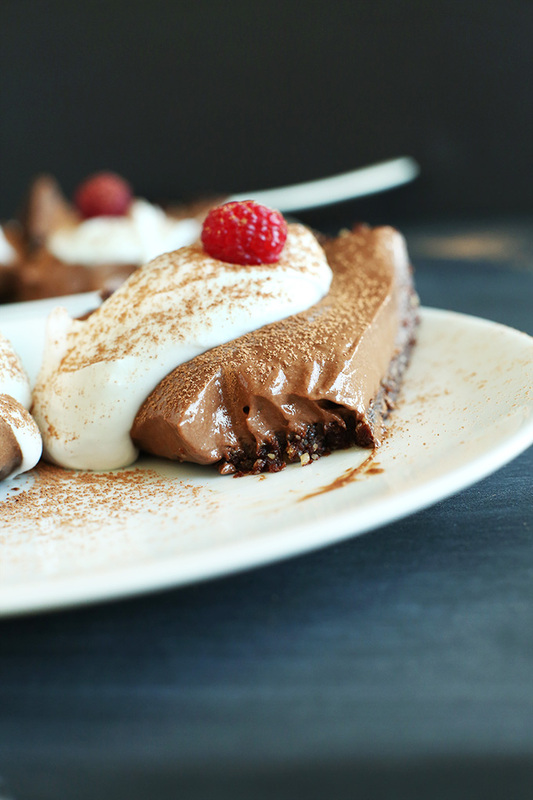 Chocolate Silk Pie is so fabulous, isn’t it? A chocolate lover’s dream come true. So indulgent, so rich, and so satisfying! I love your healthier take! This pie looks amazing!!! I wish this vegan sweet dish was around during my family’s Easter brunch today!!!! 1. This looks freaking incredible. 2. I’m going to Bali in a couple months!! Where was the name of the cafe? Would love to check it out. BALI BUDDHA. YOU MUST GO. So amazing! And they deliver!! Owowowowow. Have fun! Tofu is magical in desserts – nothing to be afraid of! I can’t wait to try this pie. Oh this was good! I made it this morning and we had a piece after supper. I had trouble getting my coconut whipped cream to firm up, it was really goopy, and I don’t have tapioca flour. But the pie is delicious. My husband said, “You could serve this to people and not tell them it’s vegan.” I love a recipe that’s so simple! Thank you! That’s always my goal! So glad you all enjoyed it, Robin! Thanks for sharing. As for the coconut whip, some brands work better than others. Thai Kitchen full fat and Trader Joe’s coconut cream ALWAYS firm up for me. Hope that helps! I always enjoy getting your recipes and they are so enticing. However, I am finding that I don’t like scrolling through all of your beautiful pictures to get to the actual recipe to see if has ingredients that I like and use. Would it be possible to list the recipe at the top, and then use all of the beautiful pictures to whet our appetites and see how it is made? I just don’t have all day to scroll and read and then be disappointed because it is not a recipe I can make. Thanks for your feedback Joan. We really do appreciate it. Although we can understand why our style might not fit with everybody, our original focus and desire here is to create something that we personally enjoy. Placing the recipe at the top is a unique idea, but ultimately one that doesn’t fit our design and vision right now. We appreciate good food photography and feel that adding our photographs to posts contribute to our art in a style that reflects our personality. Smart lady! I almost thought of doing that myself. So what I did was make the whole pie and then cut the pieces up into little bites and freeze them. Then, I could just grab a small bite whenever I wanted! Hope you enjoy it, Kayla! Oh my gosh I feel like I can taste this right through the screen! It looks SOOOOOO GOOOD! Will have to try once I am back on chocolate. Hope you are having a great weekend! Hi, this looks delicious! I was wondering, what program do you use to create the recipe-sheet? Yeah, it’s Easy Recipe. You’ll need to be on a self-hosted WordPress site to use it. If you need help, I made a 5 minute tutorial to setup a WordPress site here. Wow thank you, ok I’m going to have to think about moving my site then..
I’m always so excited to see all the creative food people make with tofu! In Japan, it’s a traditional ingredient, and it’s just… tofu, which is okay, but all of these creative recipes, especially the desserts, blows my mind! And I love your take on soy. Eating GMO, non-organic soy products probably isn’t the best thing for you or the planet, and it is true so much of soy is grown that way today. But I don’t think there’s any reason to go avoiding soy altogether, even the organic, non-GMO stuff. GMO, non-organic ANYTHING probably isn’t going to do you any favours anyway. Thanks for the inspiration and the great recipe! Thanks for your insight and encouragement, Naoko! Do you live in Japan? We so hope to visit soon! Insanely gorgeous country. I do live in Japan, it’s lovely here. It’s funny how living abroad made me appreciate the culture and the country more! Refreshing change of perspective. Same again with your tofu recipes! It makes you look at a seemingly mundane ingredient (over here) in a totally new light! Hope you come to visit soon! How awesome! John is actually going to be in Japan (Tokyo) area in May! So be on the look out (primarily on our Twitter accounts) for a word on when and where he might be if you’d like to meet up! I’m only in Tokyo for one weekend in May, but I will keep my eyes open! Give us a shout if you ever get lost or whatever, Japanese interpreter at your service! 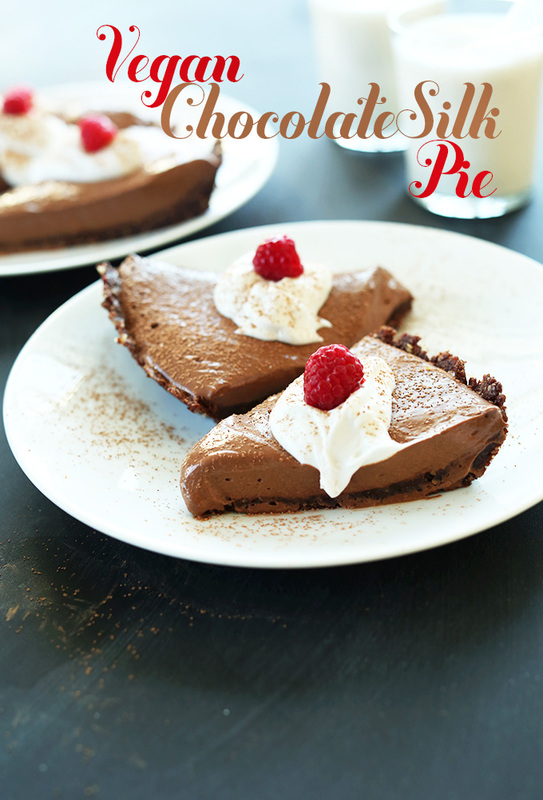 I LOVE LOVE LOVE the simplicity of this chocolate pie! And using a raw chocolate brownie for the crust!? Ingenius! Can’t wait to try this! Happy Easter! Thanks Ceara! Happy Easter to you, too! TOTALLY birthday “cake” material. Hope you enjoy it! this looks so amazing! i need to find a place to buy silken tofu, asap. Still dancing over this pie. I might have to make this for our Eat Clean Challenge group next Saturday, but I’ve pinned this recipe. Your lovely oozing chocolate gif reminds me of the one I just posted for vegan raw fudgy bars today–I’m still drooling/craving. Love it! Any chance you could site your sources? Have noticed you tend not to do that on relatively common iterations of recipes. I believe I cited my sources on this recipe. Can you give me a specific example of what you’re asking for? No worries! The references are sometimes at the bottom of posts. Glad you sorted it out! Also, just to be clear for other visitors: We try really hard to always cite appropriate sources. We love the food blog community and want to share the love they’ve shown us. If you ever think we missed something, feel free to let us know! It’s totally okay if I eat the whole thing myself, right? Love this! Ooh, a never for Averie?! I can hardly believe it! Hope you give this one a go, friend. I think you’ll be amazed at how interchangeable tofu is in traditional dairy-based desserts. I love silk pie so much – it’s so easy to make and so pretty! This vegan version rocks! Rhonda needs to get with the tofu program! I think this pie might just do the trick for her and all of those other Anti-Tofuites out there. This pie looks incredible! So mousse-like and silky. I’ll need to give it a try. Amazing! with what can I substitute the Tofu with? maybe coconut cream? Hmm, yeah I’d suggest more coconut cream. Hope that helps! I thought that, and perhaps will try that next time! I was stuck on keeping it at minimalist as possible – you know me :D Thanks for the tip, though! I make this (well, basically this) recipe all the time, too, but I’ve found that firmer tofu (experiment with what you like best) works well so it’s a bit firmer, too. But that’s just a preference thing. I also love mixing in nut butter. So many variations. Oh thanks Ashley! Do you use silken firm, or just firm? Just regular extra-firm – I squeeze out as much moisture as possible and then I feel like it gets less soft/watery when in the fridge. I actually learned that from a restaurant where I originally learned of this type of pie way back in like 2001 Hahahha I feel super old now. Smart lady! I know, I feel so old when I tell young kids today that I graduated college when they were starting high school. Sheesh. But! With age comes wisdom, no? Such as knowing that you can turn drained firm tofu into a pie. Huzzah! Thanks again for the tip. I tried this method one time attempting some vegan pudding and really didn’t like the texture/taste. But, perhaps if I try it with melted chocolate instead of cocoa powder+agave, perhaps I’ll like it a lot more. mini chips or chopped nuts, it makes it look a bit fancy. Have fun in the kitchen and enjoy the pie!! !